Online test: "Do you know how to cook buckwheat?" Do you know how to cook buckwheat? Many are surprised and asked the actual question, but what is difficult to cook buckwheat? Judging by the statistics of preparations, the result of the finished dish is not always successful. What is the reason? In order to understand whether you cook buckwheat porridge correctly or not, take an interesting test. You have already passed the test before. You can not run it again. You must login or register to start a test. Now you know exactly how to cook buckwheat and you can easily cook buckwheat porridge in pottyWith mushroom or dairy for breakfast. If you are confident in your culinary knowledge check yourself in our culinary pastry. You must use a glass of water 2,5 on a glass of buckwheat 1. Need to take a glass of water 3 1 glass of buckwheat. For perfect crumbly porridge, you must respect and follow the proven proportion of cooking. It is advisable to adhere to the following ratio of ingredients: 1 a glass of buckwheat and 2 - 2,5 a glass of water. heat the pan, and then heat the grits on it. you need to thoroughly wash the buckwheat under cool running water to get rid of debris and dust. If desired, you can heat the buckwheat in a skillet, but this is not a necessary and important factor in the preparation of crumbly porridge. It is very important to carry out thorough washing. Best of all, use a fine sieve and running water. Buckwheat is added to cold water, then you need to bring to a boil, and only then, you can reduce the heat and cook until ready. However, if you do not want to cook it on the stove, then you can use a little trick. Fill the buckwheat with boiling water and leave it at night. buckwheat should be boiled in milk, which is diluted with water. milk needs to be added after. Remember, adding milk to porridge, is carried out after it is cooked until fully cooked. The moment is important - if you want, then wait for the buckwheat to swell, and you can pour in the milk, then bring the dish to readiness. If you use a similar idea, take less water at the beginning of cooking. You can get diet porridge from it. nothing, these are variations of the name of a single product. 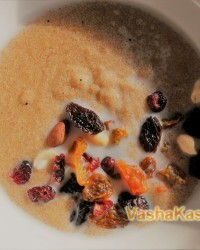 When you use it in cooking, you can get a dietary and liquid porridge, and using it, a crumbly porridge, which is served as a side dish or as an independent dish. What is the easiest way to improve the taste of buckwheat? It is advisable to wrap the freshly cooked porridge in a warm blanket, and then put it "to reach." You can pour ready porridge with condensed milk. Wrapping a pot of porridge in a warm blanket for thirty minutes is the best and proven way to improve its taste. There is another good option: put porridge in the oven, using a clay pot, leave it there for languishing. Remember that in such cases, buckwheat cannot be added to it at once, otherwise you will spoil everything. Cooking buckwheat takes about twenty minutes, then in this case, ten will suffice. similar actions are performed during the cooking process. You can add such ingredients after cooking. If you wish to add various additives to porridge: salt, spices, oil, mushrooms, onions, sauce - do it after cooking is completed. Experts recommend the following: do not touch the gruel during the cooking process, let it add. If the porridge goes to the oven, you can add melted butter to it.